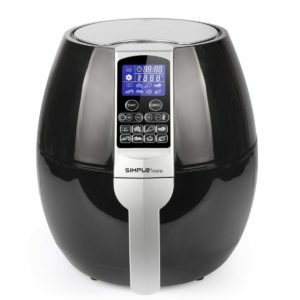 Simple Taste Air fryers have one of the best air fryers out there and if you want to get into healthier eating and are looking for the best air fryer investment then you should read this review. In the review, we would be talking about two different Simple Taste air fryer models and the pros and cons with both the devices. Simple Taste air fryers are probably the best quality air fryers on Amazon apart from the amazing Philips Air fryers. If you want to enjoy al fried foods like the French Fries, Chicken Wings and potato pops without actually deep frying it but achieving a similar taste to deep fried then the Simple Taste Air fryer can really help. 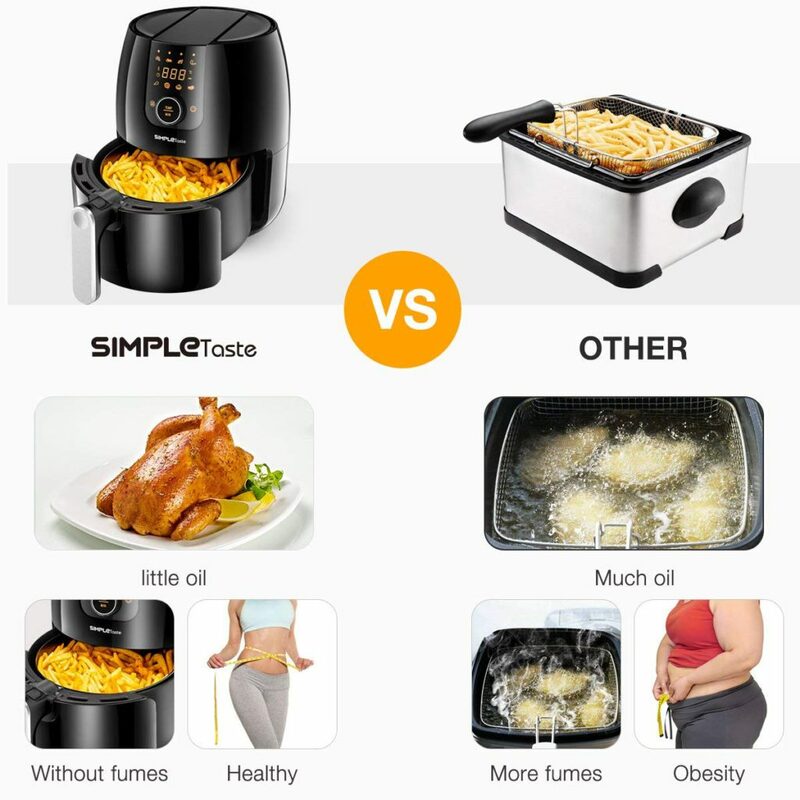 Without any further ado, let’s look at the two amazing models from Simple Taste that would help you achieve the deep frying results with minimal to no oil usage. This simple taste air fryer is pretty affordable for all the features it has to offer. The air fryer holds a capacity to cook for 2-3 people which is a good option for someone with a nuclear family looking for an air fryer. If you want to make a lifestyle change and want to reduce the unwanted oil consumption but at the same time enjoy all your fried foods then this air fryer is probably one of the best that you should get for yourself. It takes little to no oil for cooking your favorite fried foods and honestly, there were times that you just need to spray some oil on the cooking basket and that’s it. So, you can cook a whole batch of fries with just 1 tbsp of oil or even less. 1. The air fryer needs little to very less oil in order to cook a whole batch of french fries. The fries taste really good, almost the same as deep fried but not exactly the same. SO, the taste is pretty good although it is not the same as deep-fried foods. 2. The air fryer comes with digital time and temperature settings, making it really easy to set these two parameters in order to cook the dishes perfectly. There are pre-settings as well which allow you to cook any dish with some preset temperature and timings. 3. The air fryer is really easy to use, you can figure out all the settings on the air fryer the day you receive it and you can get started with using it right away without any issues. 4. You can cook almost anything in this air fryer as the basket is pretty big with the 3.2 Quarts capacity. You can even reheat your sandwiches inside the air fryer. You can try cooking multiple different recipes with the fryer and there are so many good ones out there online. 5. Cleaning this air fryer is easy as well, all you have to do is clean the cooking basket and if you want to avoid any oil spills to the bottom of the fryer then you can think of using an aluminum foil while cooking. 6. Automatic switch off and you get the food cooked evenly which is a major advantage over other cheaply made air fryers where you need to constantly turn around the food in the cooking basket so that the food is cooked evenly. 1. Well, it does take time to cook and it is not as powerful as the air fryers from Philips which are super fast and work like a dream. If you want to cook for more than 2 persons then you have to be ready with the dish before time as you might have to cook in batches. This second model from SimpleTaste has no different model name whatsoever, however, you can clearly see a slight difference between their designs and controls. 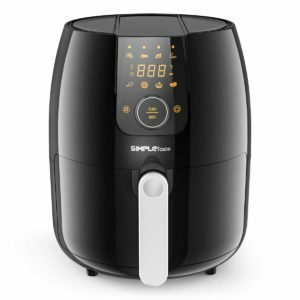 This one from Simple Taste is slightly larger than the previous air fryer and because of the design of the fryer, you can clearly cook better with this model right here. The air fryer is a bit more powerful which means it is going to cook the food faster, although there is not much of a difference if you want to invest your $10 more and get a slightly better model then why not. Overall, if we had to pick one it would be the first model, it feels more premium and easy to use compared to this one right here. Honestly, the differences are so little that they are almost the same when it comes to their functions and hence we would surely recommend the first air fryer model. Simple Taste air fryers are pretty good and with all the amazing things people had to say about them, I’m pretty sure they are going to be durable as well. The air fryer can cook anything from bread to french fries and chicken wings. Honestly, we use our air fryers to mainly cook chicken wings and fries which are our favorites, however, you can easily reheat your sandwich or even make a chili cheese toast with this air fryer with very little oil and giving you a similar taste to the deep-fried foods. Overall, the air fryer is an amazing investment and if you are looking to cut down your excessive oil consumption from junk food then this might probably be one of the easiest ways to do it where you do not need to completely avoid the foods you love. Check out the air fryer and let us know what you think in the comments down below! If you liked the post then do not forget to share it o social media with your friends who would love to try out an air fryer!